Our product range includes a wide range of coconut plant, date palm, dragon fruit plant, lemon plant, mango plant and pomegranate plant. 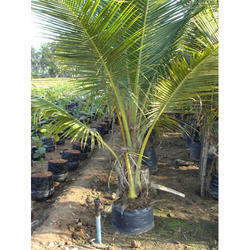 The Coconut Plant is a member of the family Arecaceae (palm family) and the only species of the genus Cocos. The term coconut can refer to the whole coconut palm or the seed, or the fruit, which, botanically, is a drupe, not a nut. A spelling coconut is an archaic form of the word.The term is derived from the 16th-century Portuguese and Spanish word coco meaning "head" or "skull", from the three indentations on the coconut shell that resemble facial features. Coconuts are known for their great versatility, as evidenced by many traditional uses, ranging from food to cosmetics. They form a regular part of the diets of many people in the tropics and subtropics. Coconuts are distinct from other fruits for their large quantity of water (also called "juice") and when immature, they are known as tender-nuts or jelly-nuts and may be harvested for their potable coconut water. When mature, they can be used as seed nuts or processed to give oil from the kernel, charcoal from the hard shell, and coir from the fibrous husk. This genus is mostly medium to robust in size, but also includes a few dwarf species; trunks are solitary in four species, suckering and clumped in nine, of which one has a prostrate ground trunk. Many of the trunked species do not form above-ground stems for several years. The pinnate leaves, 1–6 m long, all share the common feature of metamorphosed lower-leaf segments into long, vicious spines (acanthophylls). The leaves have short or absent petioles and possess the rare feature among pinnate palms of induplicate (V-shaped) leaflets. The plants are dioecious, with male and female flowers on separate plants; pollination is by both wind and insect. The flowers are inconspicuous yellowish-brown and about 1 cm wide, but grouped on conspicuous large multibranched panicles 30–90 cm long. The inflorescence emerges from a usually boat-shaped, leathery bract, forming large, pendent clusters. Phoenix fruit develops from one carpel as a berry, 1–7 cm long, yellow to red-brown or dark purple when mature, with one elongated, deeply grooved seed. Inter Cropping possible Inter Cropping is not recommended contineuosly. Only at the time of plantation. Climatic requirement It responds to humidity. So high humidity is better for best yield. Harvesting cycle 3 months from 1 year. It harvesting comes in rainy season. 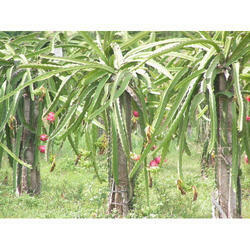 We are an esteemed wholesaler, supplier, and exporter of an exceptional quality assortment of Dragon Fruit Plant. 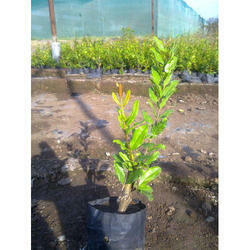 For business of lemon tree try to have a larger area for plantation of the trees. The more the area the better it is for the tree since it also spreads on a wider scale. Remember to select that area which has enough of sunlight coming there as the trees would require sunlight on a larger scale. The location should be able to provide a distance of 25 feet from other trees, fences and structures. Also they cannot withstand frost and so they will not grow in areas where the temperature may drop down to below 30 degrees, so they don’t survive cold for a long period. Thus you need to grow them in areas with enough of sunlight. Type of soil Needed for Growing Lemon Tree You need to check the ph level of the soil which should be between 5.5 to 6.5 you can even add lime to the soil in order to achieve the required levels. The soil needs to be adjusted at least one week before the plant is being put into the soil. 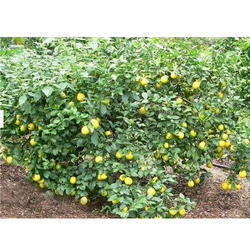 Lemons need to be saved from strong winds and also there should be enough of water drainage in the area. They grow well in fertile soil which has organic manure which should be slightly acidic. When planting the tree take special care of your hands or wear gloves in order to avoid any irritation. After the tree has been planted sprinkle nitrogen on the top of the soil around the tree. Add some water in the tree but only a little. The best aspect of lemon tree is that they are able to tolerate drought, but still add water to the plant when it becomes dry. But never add excessive water to the plant as it may catch rot diseases. The lemon tree blossoms once a year between November and January. During this time, the tree is full of blossoms. After the tree blooms, lemons will begin to appear and it will take around six months for them to mature completely. Mango is the leading fruit crop of India and considered to be the king of fruits. Besides delicious taste, excellent flavor and attractive fragrance, it is rich in vitamin A&C. The tree is hardy in nature and requires comparatively low maintenance costs. Mango occupies 22% of the total under fruits comprising of 1.2 million hectares, with a total production of 11 million tons. Uttar Pradesh and Andhra Pradesh are having the largest area under mango each with around 25% of the total area followed by Bihar, Karnataka, Kerala and Tamil Nadu. Mango fruit is utilized at all stages of its development both in its immature and mature state. Raw fruits are used for making chutney, pickles, and juices. The ripe fruits besides being used for desert are also utilized for preparing several products like squashes, syrups, nectars, jams, and jellies. The mango kernel also contains 8-10 percent good quality fat which can be used for soap and also as a substitute for coal in confectionery. Fresh mangoes and mango pulp are the important items of agri-exports from India. India''s main export destinations for mango are the USA and other Middle East countries with a limited quantity being shipped to the European market. Although India is the largest mango producing country, accounting about 60% of world production, the export of fresh fruit is limited to Alphonso and Dashehari varieties. India''s share in the world mango market is about 15 percent. Mango accounts for 40 percent of the total fruit exports from the country. There is a good scope for increasing the area and productivity of mango in the country. Mango can be grown under both tropical and sub-tropical climate from sea level to 1400 m altitude, provided there is no high humidity, rain or frost during the flowering period. 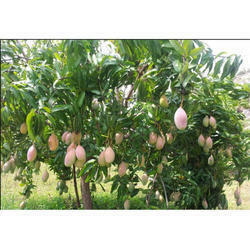 Places with good rainfall and dry summer are ideal for mango cultivation. It is better to avoid areas with winds and cyclones which may cause flower and fruit shedding and breaking of branches. Though there are nearly 1000 varieties of mango in India, only following varieties are grown in different states : Alphonso, Bangalore, Banganpalli, Bombay, Bombay Green, Dashehari, Fazli, Fernandina, Himsagar, Kesar, Kishen Bhog,Langra, Mankhurd, Mulgoa, Neelam, Samarbehist, Chausa, Suvarnarekha, Vanaraj and Zardalu. We are an esteemed wholesaler, supplier, and exporter of an exceptional quality assortment of Pomegranate Plant. Sweet Tamarind Plant is best described as sweet in taste and is high in tartaric acid, sugar, B vitamins, and, unusually for a fruit, calcium. As a tropical species, it is frost sensitive. The pinnate leaves with opposite leaflets give a billowing effect in the wind. The tamarind tree produces pod-like fruits, which contain an edible pulp that is used extensively in cuisines around the world. Other uses of the pulp include traditional medicine and metal polish. The wood can be used for woodworking, and an oil can be extracted from the seeds. Because of the tamarind's many uses, cultivation has spread around the world in tropical and subtropical zones. The tamarind is a long-lived, medium-growth, bushy tree, which attains a maximum crown height of 12 to 18 meters (39 to 59 ft). The crown has an irregular, vase-shaped outline of dense foliage. 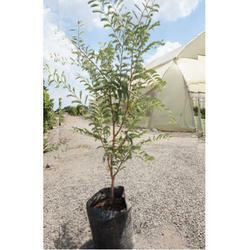 The tree grows well in full sun in clay, loam, sandy, and acidic soil types, with a high resistance to drought and aerosol salt (wind-borne salt as found in coastal areas). The evergreen leaves are alternately arranged and pinnately compound. The leaflets are bright green, elliptical ovular, pinnately veined, and less than 5 cm (2.0 in) in length. The branches droop from a single, central trunk as the tree matures and is often pruned in agriculture to optimize tree density and ease of fruit harvest. At night, the leaflets close up. The tamarind does flower, though inconspicuously, with red and yellow elongated flowers. Flowers are 2.5 cm wide (one inch), five-petalled, borne in small racemes, and yellow with orange or red streaks. Buds are pink as the four sepals are pink and are lost when the flower blooms. The fruit is an indehiscent legume, sometimes called a pod, 12 to 15 cm (4.7 to 5.9 in) in length, with a hard, brown shell. The fruit has a fleshy, juicy, acidulous pulp. It is mature when the flesh is colored brown or reddish-brown. The tamarinds of Asia have longer pods containing six to 12 seeds, whereas African and West Indian varieties have short pods containing one to six seeds. The seeds are somewhat flattened, and glossy brown. As an economical crop, it is one of the best (within it is so important to be perfect plants).Each and every plants is can saved so easily. After planting the tree in 8 months, fruits are can sold in the market. Guava (Psidium guajava) is one of the most common fruits in India. It is quite hardy and prolific bearer. Guava is a commercially significant , highly remunerative crop even without much care. It is a rich source of vitamin C and pectin. It is also a good source of calcium and phosphorus. Certain important strategies have been identified for enhancing horticulture development in India in order to be competitive in the world market. They involve adoption of modern, innovative and hitech methods. One such strategy is the high density plantation (HDP). This includes adoption of appropriate plant density, canopy management, quality planting material, support and management system with appropriate inputs. HDP generally refers to planting at a closer spacing than the normal recommended spacing. It has been attempted in different crops such as guava, apple ,banana ,mango, pineapple, peach, etc. Many guava farmers have been adopting this technology successfully in different parts of the country. HDP technology results in maximisation of unit area yield and availability of the fruits in the market early which fetch better price. Guava is successfully grown all over India. The total area and production of guava in the country are 1.90 lakh hectare and 1.68 million tonnes. Major guava producing states are Bihar, Uttar Pradesh, Maharashtra , Karnataka , Orissa, West Bengal, Andhra Pradesh and Tamil Nadu. 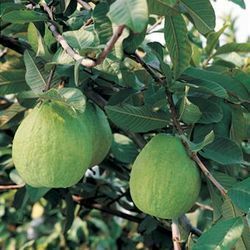 However, Uttar Pradesh, is by far the most important guava producing state of the country and Allahabad has the reputation of growing the best guava in the country as well as in the world. Guava is very hardy. It can thrive on all types of soil from alluvial to lateric. However, it is sensitive to waterlogging. It can be grown on heavier but well drained soil. Deep friable and well-drained soils are the best. The top soil should be rich for better stand. Soil pH range of 4.5 to 8.2 is congenial for guava but saline or alkaline soils are unsuitable. Guava is successfully grown under both tropical and subtropical climates. It can grow from sea level to an attitude of about 1500 m (5000'). An annual rainfall of below 1000 mm (40') between June and September is the best for the growth of guava plants. Young plants are susceptible to drought and cold conditions. Yield and quality improve in areas with a distinct winter season. 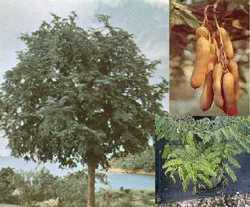 We are the only one producr of sweet tamarind plant in India. We have very well managed mother block for it. We had developed it at our farm only. VitaminsTamarinds contains small amounts of a variety of vitamins, including vitamins A, C, E and K. In addition, tamarinds are a rich source of a number of B-vitamins. This includes between 34 percent of the DV for thiamine for adults and children four years of age and older, 11 percent of the DV for riboflavin and 12 percent of your DV for niacin, according to the U.S. Food and Drug Administration. As all B-vitamins are essential to the metabolism of glucose, fats and protein, tamarinds can help you to meet your fitness goals. In addition, B-vitamins help to regulate your body's production of stress hormones, potentially reducing stress and helping you to feel calm throughout the day.